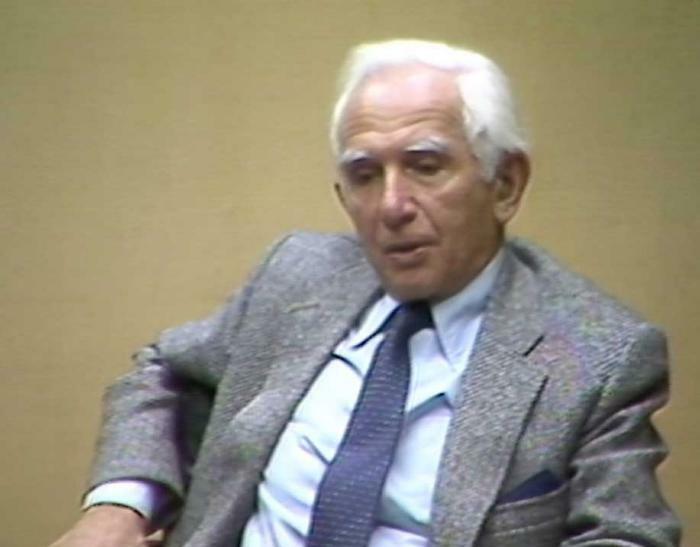 Still image from Eric S. Holocaust testimony, December 5, 1984. SynopsisEric S. was born in 1916 in Šumperk, Moravia, which was part of the Austro-Hungarian empire at the time. He recalls attending public school and receiving religious instruction from a rabbi. He describes his active participation in a Zionist group. He recalls his father’s death in 1933. He describes attending university in 1934. He discusses the German occupation and the family’s forced expulsion from their town. He describes imprisonment for six weeks in 1940 and his release. He describes getting married and living in a village. He recalls deportation to Theresienstadt with his wife and mother in May 1942. Eric discusses his privileged position working the gardens due to knowing several leaders. He recalls smuggling food. He discusses the administration of Theresienstadt. He describes the deteriorating conditions of the ghetto and learning that deportation meant death. Eric describes his deportation to Auschwitz in the autumn of 1944 (he never saw his wife or mother again). He describes his transfer to a Bavarian slave labor camp [Dachau sub-camp, Kaufering] in early 1945 and the evacuation of the camp by train. He recalls his escape, along with many others, and liberation by United States troops. He recalls living in Munich after the war until returning to Prague where he married again in 1947. Eric discusses their decision to emigration to Canada in 1947. He discusses a recent trip to Czechoslovakia with his family and sharing his experiences with them.